The international event specialized in Adventure travel, one of its kinds in ASIA, successfully concluded by MP tourism from 4th December- 5th December 2018 at the new International Convention Centre – Minto Hall in Bhopal, Madhya Pradesh, India. It focused on adventure tourism by combining marketplace (chowk Bazar), meetings, networking opportunities, inspirational speakers and educational sessions together for national attendees as well as delegations from aboard. Speaking on the occasion, Hon’ble Hari Ranjan Rao (IAS), Principal Secretary Tourism and Managing director, Madhya Pradesh Tourism Board said, “Madhya Pradesh is truly honored and privileged for being the ever first host of AdventureNext in Asia. We thank ATTA and all the respected international buyers, felicitators, media and national delegates who came together to make this event a grand success. 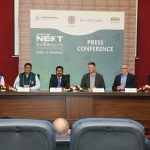 The AdventureNext not only brought together the networking sessions but it also gave a unique definition to the hidden treasures of adventure tourism in India. With this we focus to promote the adventure travel aspect with full pace in Madhya Pradesh as well”. The two days long event encapsulated the theme “Pulse of Tomorrow” indulging delegates to explore future-driven business opportunities from Madhya Pradesh, the heart of incredible India. The indulgent agenda featured trending topics such as economics of wildlife tourism and immersive technology while the educational workshops like traditional Gond Art show kept attendees engaged. For the prestigious event, the cultural programs included performances of popular Indian dances- Bharat Natyam, Mohini Attam, tribal folk dances. Madhya Pradesh will also be conducting pre and post familiarization trips to various destinations, believing that the tour will captivate the hearts and imagination of every traveler and immerse their senses in the heart of Incredible India.